Recorded in a wide number of spellings including Hoppner (18th century English), Hopfner, Hopfer, Hoptner, Heptner, Heppner, Hopfaur, Hopfenfuhrer (German), Hopfer, Hoffner, Hopman (Jewish), Hopman, Van Hoppe (Dutch), Hopfli (Swisse), this is a medieval surname of pre 6th century Germanic origins. 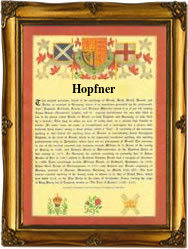 It is occupational, derives from the ancient word "hopfen, and describes either a grower of hops, or by association a nickname for a brewer.Although occupational surnames were the first to be created, they did not become hereditary until a son or sometimes a daughter, continued in the same trade as the father, or the mother. If this did not happen, the name died out, the siblings being known by their own occupation, although with this sometimes tacked onto the father (or mother's) surname. This name is well recorded in Germany from the 13th century with early examples being Wetzelin Hoppener zu Greifswald in the charters of 1304, and Johan Hopfer zu Basel, Switzerland, in 1395. In the British Isles Hopp, Hoppes, and Hopper, are believed to have described a dancer, not a hop grower, although there may well have been an overlap. In the city of London church registers the first recording is that of Anna Hoppner who married John Meyer at St James church, Westminster, on December 22nd 1767.